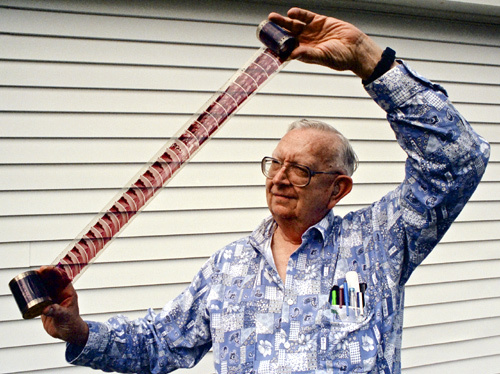 Brian O'Brien, Jr. in May 1997 with a piece of distortion corrected 70mm film from "Around the World in 80 Days"
Brian O'Brien, Jr., 90, born March 13, 1923, passed away at Matulaitis Rehabilitation and Skilled Care on September 11, 2013, after a period of declining health. He was born in Pittsburgh, PA, the only child of Brian and Ethel (Dickerman) O’Brien. Brian was predeceased by his beloved wife, Kathryn "Towie" (Jensen) O’Brien. Brian was a graduate of the University of Rochester, NY, where he majored in optics and chemistry at the request of Mr. Eastman. He earned his master’s in chemistry at MIT, Boston, MA, after serving in the United States Navy during WWII as a Lieutenant. He worked for Todd-AO early in his career, and along with his father, was very involved in the technology development of wide-screen system for cinema. Later in his career, he worked for Itek and Northrup Grumman. 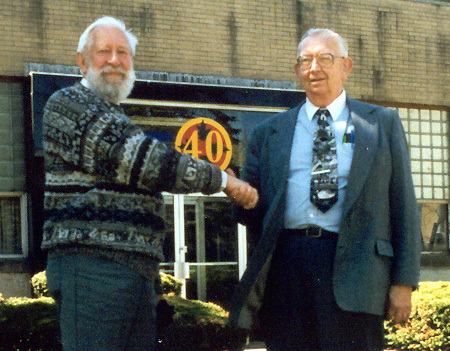 After his retirement, he mastered Photoshop and cataloged thousands of slides and photographs on his computer. He was an avid supporter of increasing the railroads in the US and was a member of the Worcester Model Railroaders. He was an Eagle Scout and a long-time Scout Leader in Thompson. He also held a pilot’s license and piloted his own Cessna, yet abhorred commercial flying choosing to travel by train whenever possible. Brian leaves his close friends, Kerstin and Richard Forrester of Fabyan, and his caretakers who provided 24/7 care during the past two and a half years: Dianna Rebello of Woodstock, CT; Timothy Arsenault of Fabyan; Nicholas Rebello of Woodstock; Ashley Morin of Woodstock. He also leaves his brother-in-law, William S. Jensen and his wife Carolyn of Vancouver, WA; sister’s-in-law Eloise N. Jensen of Tucson, AZ and Susan M. Jensen of Seattle, WA; step-brother-in-law James B. Leonard of Seattle, WA. He was predeceased by brother-in-law George J. Jensen, survived by wife JoAnn of Kenmore, WA. He also is survived by 11 nieces and nephews of whom he was very fond. In lieu of flowers, donations may be made to Boy Scout troop #30, Quinebaug, CT, or to the Towie O’Brien Memorial Fund of the Mary Fisher Memorial Elementary School of the Town of Thompson, CT.